In the 2012 Chevrolet Suburban LS 1500, families will find a rugged, spacious and handsome 8- or 9-passenger half-ton SUV that defines the genre. Blessed with 137.4 cubic feet of cargo room with the rear seats folded, this rear-wheel-drive workhorse will carry its share of the load, while the right equipment will allow it to tow up to 8,100 pounds. Even at its most basic, the entry-level LS 1500 comes with standard 17-inch alloy wheels, step running boards, heated, power-adjustable mirrors, a roof rack and a Class III trailer hitch and wiring adorning its oversize profile. Premium cloth upholstery, simulated alloy trim and a leather steering wheel, meantime, grace a roomy, comfortable cabin. Power door locks and windows also come standard on this big Chevy, as do front power-adjustable bucket seats, front and rear floor mats, tilt-wheel steering, cruise control, tri-zone climate control and OnStar Directions and Connections service. Entertainment is handled by an MP3-capable single-CD player and 6 speakers bolstered by satellite radio and a USB connection, with Bluetooth hands-free technology and phone pre-wiring taking care of in-vehicle communications. Options for the 2012 Suburban LS 1500, either in package form or as standalones, include heavy-duty towing equipment with integrated trailer brake controller, remote engine start, rear parking sensors, a rear-view camera, upgraded appearance and cabin accoutrements including 20-inch polished aluminum wheels, 3.42 axle ratio, an auto-dimming rear-view mirror and power-adjustable pedals. The standard engine for the 2012 Suburban LS 1500 is a 320-hp 5.3-liter ethanol-capable (FFV) V8. Coupled with the standard 6-speed shiftable automatic transmission, this potent V8 puts out 335 lb-ft of torque, can tow 8,100 pounds with the proper equipment and, with variable valve timing (VVT) and cylinder deactivation, is estimated to get 15 mpg city/21 highway. Additionally, the brake hill-holder feature and a rear locking differential also come standard with this capable drivetrain. 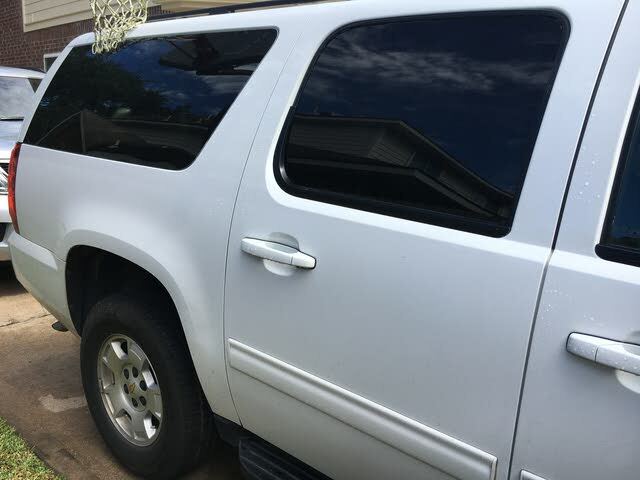 Standard safety features in the 2012 Suburban LS 1500, besides its awesome size, include 4-wheel antilock brakes (ABS), traction and stability control, front side-mounted airbags and three-row head airbags. OnStar Emergency Service, Airbag Deployment Notification and Stolen Vehicle Tracking, as well as daytime running lights, a post-collision safety system and a remote antitheft alarm also come standard in this rough-and-ready sport ute. Turn-signal-integrated mirrors, by the way, are an optional safety feature. Venerable and versatile, rugged and reliable, the three-quarter-ton 2012 Chevrolet Suburban LS 2500 is the real deal. This base trim is anything but basic, with 137.4 cubic feet of cargo space, three rows of seating for up to 9 and an ethanol-capable V8 adorning its hefty frame. Ride and handling prowess are a cut above the average in this progenitor of the full-size SUV clan, with such exterior endowments as 17-inch alloy wheels and all-terrain tires, a roof rack, step running boards and heated power-adjustable mirrors, as well as a trailer hitch and wiring, all standard. Cabin amenities include premium cloth upholstery, power-adjustable front seats, tri-zone climate control and power door locks and windows. Then there are such conveniences as tilt-wheel steering, cruise control and OnStar Directions and Connections service. All of this is complemented by a leather steering wheel and simulated alloy dash and door trim, while occupants are entertained by an MP3-capable single-CD player with 6 speakers bolstered by satellite radio and a USB connection. Finally, standard Bluetooth hands-free technology and phone pre-wiring wind up the list of standard techno-gizmos. Options and packages include such items as heavy-duty axle ratios, upgraded 20-inch wheels, split bench front seats for 9-passenger seating, upgraded interior and exterior appearance features, remote engine start, rear parking sensors, a rear-view camera and power-adjustable pedals. The rear-wheel-drive (RWD) 2012 Suburban LS 2500 boasts a well-wrought 6.0-liter E85-capable V8 engine, again managed by the shiftable 6-speed automatic transmission with the brake hill-holder. Look for this big V8 to pound out 352 hp and 382 lb-ft of torque, pull up to 9,600 pounds of trailer when properly equipped and guzzle gas at a prodigious 10 mpg city/16 highway, despite variable valve timing (VVT) and cylinder deactivation at highway speeds. Safety-wise, the 2012 Suburban LS 2500 counts heavily on it’s size and weight to see it through, but wields 4-wheel antilock brakes (ABS), as well as traction and stability control, just in case. This heavy hauler also sports front side-mounted airbags and three-row head airbags, as well as OnStar Emergency Service, Airbag Deployment Notification and Stolen Vehicle Tracking. Finally, daytime running lights, a post-collision safety system and a remote antitheft alarm are all additional standard safety equipment, with turn-signal-integrated mirrors an available safety extra. Take an already imposing full-size SUV, add part-time 4-wheel drive (4WD) and behold the 2012 Chevrolet Suburban LS 1500 AWD. This well-wrought half-ton sport ute additionally sports three rows of seating for up to 9 passengers and 137.4 cubic feet of cargo space, thus offering itself as a well-rounded family hauler. Complementing 17-inch alloy wheels, a roof rack, heated power-adjustable mirrors, step running boards and a trailer hitch and wiring outside are cabin accoutrements like power-adjustable front bucket seats, premium cloth upholstery, a leather steering wheel and simulated alloy dash and door trim. Comfort and convenience features such as tri-zone climate control, power windows and remote door locks, cruise control and the popular OnStar Directions and Connections hookup also come standard on this base trim. A single-CD player, meanwhile, along with 6 speakers, satellite radio and a USB connection, graces the LS 1500 4WD, as does Bluetooth hands-free technology interfaced with phone pre-wiring. An available heavy-duty trailer towing package with integrated trailer brake controller is just one of the packages offered with the 2012 Suburban LS 1500 4WD. Then there are such fan favorites as 20-inch polished aluminum wheels, a 3.42 axle ratio, all-terrain tires, remote engine start, parking sensors, a rear-view camera, auto-dimming rear-view mirror, power-adjustable pedals and a heavy-duty axle ratio also padding the options list along with various appearance and cabin upgrades, including available front split bench seats for 9-passenger capacity. A perfectly adequate 5.3-liter E85-capable (FFV) V8 powers the 2012 Suburban LS 1500 4WD. Combined with the standard 6-speed shiftable transmission, the V8 pounds out 320 hp and 335 lb-ft of torque, good enough to tow up to 8,100 pounds with the proper equipment. Variable valve timing (VVT) and cylinder deactivation allow 15 mpg city/21 highway, and this big ute also sports a brake hill-holder and mechanical locking center differential. All this is, of course, complemented by on-demand 4WD that’s managed by available auto-locking hubs and manual hi-lo gear selection in two-speed systems. The hi-lo gearing is, of course, deleted from the standard single-speed 4WD differential. Look for the 2012 Suburban LS 1500 4WD’s sheer bulk to protect occupants from serious harm on the road, though this hefty brute still mounts 4-wheel antilock brakes (ABS), as well as traction and stability control to keep it street-wise. Then there are such standard safety items as front side-mounted airbags, three-row head airbags and OnStar Emergency Service, Airbag Deployment Notification and Stolen Vehicle Tracking all doing their bit to protect occupants. Standard daytime running lights, a post-collision safety system and a remote antitheft alarm round out the list of notable safety equipment aboard this hefty ute, with turn-signal-integrated mirrors optional. Equipped with on-demand 4-wheel drive (4WD), the 2012 Chevrolet Suburban LS 2500 4WD is ready for blizzards, wooded trails, even the mall. This three-row full-size SUV carries up to 9 passengers, with available front row bench seats, and boasts a class-leading 137.4 cubic feet of cargo space with the rear seats folded. Though the base trim of the Suburban lineup, this hefty ute still comes endowed with exterior features such as standard 17-inch alloy wheels and all-terrain tires, a roof rack, a trailer hitch and wiring, heated power-adjustable mirrors and step running boards. Inside, this behemoth boasts premium cloth upholstery, power-adjustable front seats and remote power door locks and power windows, as well as tri-zone climate control, simulated alloy dash and door trim and a leather steering wheel. Convenience features are headlined by OnStar Directions and Connections service, and also include cruise control and tilt-wheel steering. Entertainment is provided by a single-CD player with 6 speakers, satellite radio and a USB connection, while communications are handled by standard Bluetooth hands-free technology and phone pre-wiring. Options, meanwhile, consist of, among other things, upgraded 18- and 20-inch wheels, remote engine start, rear parking sensors, a rear-view camera, upgraded audio components, an auto-dimming rear-view mirror, power-adjustable pedals and power-folding outside mirrors. A potent 6.0-liter Flex Fuel (FFV) V8 powers the 2012 Suburban LS 2500 4WD. In combination with the standard 6-speed shiftable automatic transmission, this big V8 pounds out 352 hp and 382 lb-ft of torque, good enough to tow 9,600 pounds when properly equipped. Mileage, alas, is estimated at 10 mpg city/15 highway, even with variable valve timing and cylinder deactivation technology. The on-demand 4WD, meanwhile, features auto-locking hubs and electronic hi-lo gear selection. Standard safety equipment aboard the 2012 Suburban LS 2500 4WD includes 4-wheel antilock braking (ABS), traction and stability control, front side-mounted airbags and three-row head airbags. Also standard in this hefty hauler is OnStar Emergency Service, Airbag Deployment Notification and Stolen Vehicle Tracking. Then there are standard daytime running lights, a post-collision safety system and a remote antitheft alarm, with the option of turn-signal-integrated mirrors. The 2012 Chevrolet Suburban LT 1500 full-size SUV represents the midpoint of the lineup, and boasts 137.4 cubic feet of cargo space, three rows of seating for up to 9 passengers and a sturdy V8 powerplant. Added to these basics are exterior goodies like 17-inch alloy wheels, a roof rack, step running boards, heated power-adjustable mirrors and a trailer hitch and wiring. Inside, expect heated power-adjustable front seats, leather-trimmed upholstery, remote power door locks and windows, simulated wood and simulated alloy trim on doors and dash and a leather-wrapped steering wheel. Power-adjustable pedals and rear parking sensors also come standard, as does remote engine start, cruise control, tri-zone climate control, tilt-wheel steering, Sun Sensor automatic lighting and climate control and OnStar Directions and Connections. An MP3-capable single-CD player sends tunes through 9 Bose premium speakers, bolstered by satellite radio, a USB connection and rear audio controls. Finally, standard Bluetooth technology is interfaced with phone pre-wiring for hands-free communications capability. Options for the 2012 Suburban LT 1500 include a trailer-towing package with integrated trailer brake controller and heavy-duty axle ratio, as well as the popular Z71 Off-Road Package. Memory for driver's seat, mirror and pedal settings, hard-drive-based navigation and upgraded 20-inch alloy wheels all come in various packages as well. Further options include reclining rear seats, rear-seat DVD entertainment, a universal remote garage door opener and a rear-view camera, a power sunroof, power rear liftgate and power-adjustable pedals, again, either as standalone options or as part of various packages. Powering the rear-wheel-drive (RWD) 2012 Suburban LT 1500 is a variable-valve-timed (VVT) 320-hp Flex Fuel (FFV) V8 engine. The standard 6-speed shiftable automatic transmission manages 335 lb-ft of torque to allow 8,100 pounds of towing capacity with the proper equipment. Despite VVT and cylinder deactivation at highway speeds, mileage is a tepid 15 mpg city/21 highway. Included in the list of standard safety features for the 2012 Suburban LT 1500 are 4-wheel antilock brakes (ABS), traction and stability control, front side-mounted seatbelts and three-row head airbags. Additional safety equipment includes daytime running lights, a post-collision safety system and a remote antitheft alarm. Finally, turn-signal-integrated mirrors are a safety option. Need a good-looking, feature-laden full-size SUV for towing, hauling and comfortable people-moving? Check out the three-quarter-ton 2012 Chevrolet Suburban LT 2500. This big Chevy offers 137.4 cubic feet of cargo space with the rear seats folded, a potent V8 and, best of all, seating for up to 9 people. Look for standard appearance features like 17-inch alloy wheels, a roof rack, step running boards, power-adjustable heated mirrors and a trailer hitch and wiring, with leather-appointed upholstery, heated, power-adjustable front seats, a leather and simulated-alloy steering wheel and simulated wood and simulated alloy dash and door trim inside. Comfort and convenience features include power windows and door locks, tri-zone climate control, cruise control, tilt-wheel steering, rear parking sensors, remote engine start, adjustable pedals and Sun Sensor auto-adjusting lighting and climate control. An MP3-capable single-CD player and 9 Bose premium speakers, along with satellite radio and a USB connection, provide the tunes, while phone pre-wiring and Bluetooth hands-free technology will handle communications. All of this is complemented, meantime, by standard OnStar Directions and Connections service. A slew of options packages include upgraded 18- and 20-inch wheels, a power sunroof, rear-seat DVD entertainment, a rear-view camera, front bench seating (9 passengers), reclining second-row bucket seats (7 passengers), hard-drive-based navigation, memory for driver's settings and power-folding outside mirrors. A potent 6.0-liter Flex Fuel V8 engine powers the rear-wheel-drive (RWD) 2012 Suburban LT 2500, managed by the ubiquitous 6-speed shiftable automatic transmission. This combo delivers 352 hp and 382 lb-ft of torque and can pull up to 9,600 pounds of trailer, but, alas, is estimated to get only 10 mpg city/16 highway, despite variable valve timing (VVT) and cylinder deactivation on the highway. Standard safety features aboard this big Chevy SUV include, besides its notable size, 4-wheel antilock brakes, traction and stability control, front side-mounted airbags and three-row head airbags. Further safety items delivered with the LT 2500 include daytime running lights, a post-collision safety system and a remote antitheft alarm, all complemented by OnStar Emergency Service, Stolen Vehicle Tracking and Airbag Deployment Notification. Turn-signal-integrated mirrors, meanwhile, are optional. Big and bold, loaded with standard features, V8-powered and boasting on-demand 4-wheel drive (4WD)—all of that describes the 2012 Chevrolet Suburban LT 1500 AWD. This full-size SUV additionally sports three rows of seating for up to 9 passengers and 137.4 cubic feet of cargo space with the rear seats folded. Topping the list of standard exterior features are 17-inch alloy wheels, a trailer hitch and wiring, heated power-adjustable mirrors, a roof rack and step running boards. Inside, look for standard leather-trimmed upholstery, heated, power-adjustable front seats, a leather and simulated-alloy steering wheel and simulated wood and simulated alloy dash and door trim. Convenience and techno-features include tilt-wheel steering, cruise control, rear parking sensors, remote engine start, power windows and door locks, tri-zone climate control and Sun Sensor automatic lighting and climate-control adjustment. OnStar Directions and Connections service is also standard, with an MP3-capable single-CD player and 9 Bose premium speakers, bolstered by satellite radio and a USB connection, providing entertainment. Finally, standard Bluetooth technology and phone pre-wiring are also included among this big ute’s standard features. Options, meantime, include packages with a power liftgate, a heavy-duty trailer-towing package with integrated trailer brake controller, hard-drive-based navigation, memory for driver's settings and a universal remote garage door opener. Further options, either standalone or in package form, include a power sunroof, 18- and 20-inch alloy wheels, a rear-view camera, rear-seat DVD entertainment, leather second-row reclining bucket seats for 7-passenger seating or front bench seats for 9-passenger seating. Powering the 2012 Suburban LT 1500 AWD is an ethanol-capable (FFV) 320-hp 5.3-liter V8 engine that’s managed by a standard 6-speed shiftable automatic transmission. Look for 335 lb-ft of torque out of the V8, good enough to tow 8,100 pounds with the proper equipment. Despite variable valve timing and cylinder deactivation at highway speeds, mileage is estimated at a paltry 15 mpg city/21 highway. Finally, the LT 1500 4WD sports auto-locking hubs and a choice of the standard single-speed or available two-speed 4WD differential, with electronic hi-lo gear selection standard on the two-speed and not available with the single speed. Safety-wise, this big ute’s sheer bulk is its major safety advantage, but it still carries 4-wheel antilock brakes, traction and stability control, front side-mounted airbags and three-zone head airbags. Further standard safety items include daytime running lights, a post-collision safety system and remote antitheft alarm, while turn-signal-integrated mirrors are a safety option. Put terrain-taming, on-demand 4-wheel drive (4WD) into Chevy’s midlevel full-size SUV and behold the 2012 Chevrolet Suburban LT 2500 4WD. A plush ride, 137.4 cubic feet of cargo area, three rows of seating for up to 9 occupants and a big V8 powerplant are complemented by standard 17-inch alloy wheels, a trailer hitch and wiring, step running boards, heated power-adjustable mirrors and a roof rack. This big ute’s cabin, furthermore, boasts standard leather upholstery, heated, power-adjustable front bucket seats and a leather steering wheel, as well as simulated wood and simulated alloy dash and door accents for some added posh. Then there are such standard convenience features as tilt-wheel steering, rear parking sensors, tri-zone climate control, remote engine start, cruise control, adjustable pedals and Sun Sensor automatic lighting and climate control. Nine Bose premium speakers handle an MP3-capable single-CD player and are bolstered by satellite radio and a USB connection, while standard OnStar Directions and Connections service is interfaced with Bluetooth hands-free technology and phone pre-wiring. As for optional equipment, upgraded 18- and 20-inch wheels and a power sunroof are available outside, and rear-seat DVD entertainment, as well as hard-drive-based navigation, a rear-view camera, a power liftgate and a universal remote garage door opener can be ordered for the cabin, most as a part of various packages. Additionally the 2012 Suburban LT 2500 4WD can be delivered with front bench seating and/or reclining second-row seats accommodating 7 to 9 passengers. A 352-hp 6.0-liter V8 with Flex Fuel capability (FFV) powers the 2012 Suburban LT 2500 4WD, while a 6-speed shiftable automatic transmission allows 382 lb-ft of torque for up to 9,600 pounds of towing capacity with the proper equipment. The on-demand 4WD system, meantime, sports auto-locking hubs and electronic hi-lo gear selection, but gas mileage, despite variable valve timing and cylinder deactivation at highway speeds, is a woeful 10 mpg city/15 highway. Safety-wise, the 2012 Suburban LT 2500 4WD, though a road-ruling behemoth, nevertheless sports 4-wheel antilock brakes (ABS), as well as traction and stability control. Occupants, meantime, are protected by front side-mounted airbags and three-row head airbags, with OnStar Emergency Service, Airbag Deployment Notification and Stolen Vehicle Tracking also part of the standard safety equipment aboard. Finally, daytime running lights, post-collision safety systems and a remote antitheft alarm are all standard, with turn-signal-integrated mirrors optional. As the flagship of the Suburban lineup, the 2012 Chevrolet Suburban LTZ 1500 comes admirably equipped. This full-size Sport ute boasts the usual 137.4 cubic feet of cargo area with the rear seats folded and three rows of seating for up to 8 occupants. Top-shelf standard exterior features include 20-inch alloy wheels, heated, power-adjustable mirrors, step running boards, a roof rack and a power rear liftgate. The posh cabin, meantime, hosts standard premium leather upholstery, heated, 8-way power-adjustable front bucket seats, heated, reclining second-row bucket seating with the power-fold feature, a heated, leather-wrapped steering wheel and simulated wood and simulated alloy dash, door and center console accents. Further comfort and convenience highlights include tri-zone climate control (with Sun Sensor auto-adjustment), memory for driver's settings, cruise control, power door locks and windows, tilt-wheel steering, a universal remote garage door opener, rear parking sensors and a rear-view camera. Additionally, the popular OnStar Directions and Connections service is complemented by standard Bluetooth hands-free technology and phone pre-wiring, not to mention standard hard-drive-based navigation. Entertainment is furnished by an MP3-capable single-CD player with 10 Bose premium speakers, satellite radio and a USB connection. Options for this high-end trim include a power sunroof and rear-seat DVD entertainment, as well as upgraded 22-inch wheels, a heavy-duty tow package and a second-row bench seat that provides space for 8. Powering the 2012 Suburban LTZ 1500 is a 5.3-liter Flex Fuel (FFV) V8 that’s mated with a 6-speed shiftable automatic transmission. This pairing puts out 320 hp and 335 lb-ft of torque, good for 8,100 pounds of towing with the proper equipment. Mileage, however, is estimated at a tepid 15 mpg city/21 highway, despite variable valve timing (VVT) and cylinder deactivation at highway speeds. This flagship Chevy SUV also boasts the standard Autoride Suspension to smooth out those bumps in the road. Though big and beefy, the 2012 Suburban LTZ 1500 nevertheless boasts 4-wheel antilock brakes (ABS) as well as traction and stability control. For occupant safety, front side-mounted airbags and three-row head airbags are included in the list of standard safety equipment, as are OnStar Emergency Service, Airbag Deployment Notification and Stolen Vehicle Tracking. Finally, turn-signal-integrated mirrors, daytime running lights, front fog/driving lights, a post-collision safety system and a remote antitheft alarm also come standard on this big ute. Surround yourself with premium leather, simulated wood and simulated alloy ambiance, and then laugh at winter with the 2012 Chevrolet Suburban LTZ 1500 4WD. This full-size SUV sports 137 cubic feet of cargo space, three rows of seating for up to 8 people and on demand 4-wheel-drive (4WD) traction. It also boasts standard 20-inch alloy wheels, a roof rack, heated power adjustable outside mirrors, step running boards and a trailer hitch and wiring, not to mention heated power-adjustable front and second-row seats. The second-row seating also reclines and has a handy power-fold feature. Further standard comfort and convenience features include power windows and door locks, cruise control, tilt-wheel steering, tri-zone climate control, a heated, leather-wrapped steering wheel, a universal remote garage door opener and Sun Sensor automatic lighting and climate control adjustment. Techno-gizmos include On Star Directions and Connections, as well as Bluetooth hands-free communications features and a hard-drive-based navigation system. Entertainment is via 10 Bose premium speakers hooked up to an MP3-capable single-CD player, all bolstered by satellite radio and a USB connection. Options for Chevy’s hefty hauler include a power sunroof and rear-seat DVD entertainment, as well as a heavy-duty trailer towing package, power-retractable assist steps and second-row bench seating for the aforementioned 8-passenger capacity. An adequately potent 5.3-liter Flex Fuel V8 engine powers the 2012 Suburban, with the standard 6-speed shiftable automatic transmission managing 320 ponies and 335 lb-ft of torque. Towing is maxed out at 8,100 pounds, and mileage is estimated at 15 mpg city/21 highway, not so hot considering variable valve timing and cylinder deactivation at high speeds. Meanwhile the part-time 4WD system features auto-locking hubs and electronic hi-lo gear selection. Of course, this flagship Chevy ute additionally sports the road-leveling Autoride Suspension. Standard safety features, though a bit redundant on such a large vehicle, nonetheless include 4-wheel antilock brakes (ABS), as well as traction and stability control. Occupant safety is helped by front side-mounted airbags, three-row head airbags and by the highly touted OnStar Emergency Service, Airbag Deployment Notification and Stolen Vehicle Tracking. Further standard safety items include turn-signal-integrated mirrors, front fog/driving lights, daytime running lights, a post-collision safety system and a remote antitheft alarm.